Description: Lady Aileana Kameron, the only daughter of the Marquess of Douglas, was destined for a life carefully planned around Edinburgh's social events – right up until a faery killed her mother. Now it's the 1844 winter season and Aileana slaughters faeries in secret, in between the endless round of parties, tea and balls. Armed with modified percussion pistols and explosives, she sheds her aristocratic facade every night to go hunting. She's determined to track down the faery who murdered her mother, and to destroy any who prey on humans in the city's many dark alleyways. But the balance between high society and her private war is a delicate one, and as the fae infiltrate the ballroom and Aileana's father returns home, she has decisions to make. How much is she willing to lose – and just how far will Aileana go for revenge? 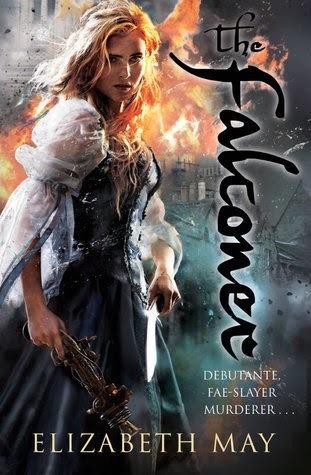 The Falconer by Elizabeth May was dark, blood thirsty and fierce. It was a story that had everything I was looking for. It had a fierce heroine out for blood, murderous fairies and plenty of steampunk elements. As a bonus it was all set in historical Scotland. Right from the start this book was fresh and entertaining with its subtle combination of bloodshed and sarcastic humour. This book packs a punch especially with the ending with a dozy of a cliffhanger that leaves you right in the middle of the action. If you like steampunk and fae then this book is a must read. The tone of this book is quite dark as the book focuses on vengeance and revenge. Aileana is an aristocratic whose life revolved around balls and finding a husband. But that all changes when she witnesses her mother being killed by the fae. Now Lady Aileana is out for blood as she wanders Edinburgh at night stalking and brutally killing faeries. There are no rainbows and sunshine in this book. Aileana is a very stubborn and fierce girl but her mother’s death changes her into a killer. She prefers to bask in the power surrounding a kill. Helping her along the way are Kiaran, Derrick, and Gavin. Aileana was a very complex character as her actions were driven by intense emotions. She has to deal with the death of her mother, soul crushing guilt and sadness, a tumultuous relationship with her father and her future as an aristocratic lady. The struggle Aileana goes through is compelling as she tries to reconcile her past with the person she is now. She tries to balance her aristocratic life with her secret one which complicates her life and gives rise to unexpected and sometimes funny situations. Here is a girl who fights to the death in a ball gown. May has incorporated steampunk elements into the story, which were fascinating. I would like to have a bit more information about how they work, but they fit in well with the world building. Aileana is also an inventor and comes up with very ingenious ways to create weapons. This is one lady you really should not piss off. The setting was also wonderful. You get to quite a bit of Scotland as Aileana runs around giving the book a great atmosphere. The romance in this book is done well, although there are hints at a love triangle. It does not overpower the story as it is woven in subtly. Kiaran MacKay is a mysterious principled male counterpart. He pushes Aileana and trains her to be the best she can be. Their relationship is often combative but filled with unresolved feelings. What I loved about their relationship is that Alieaana doesn’t trust Kiaran for the most part and is acutely aware of the consequences of getting close to him. She’s very guarded but doesn’t forgive his ways and make excuses for his behaviour. She see’s him for what he is. If was refreshing compared to other books where the heroine always ignores the true nature of the love interest and falls in love with him. Aileana knows what she’s getting into. However the person I adored in this story was Derrick the pixie. He was such a standout character for me. He was protective of Aileana and I loved his arguments with Kiaran. I just want more Derrick especially drunk Derrick. The Falconer is a blood thirsty, dark fantasy about fairies in Scotland. It’s a great read with a fantastic protagonist and a compelling story.